Remember the function served by plants and structures is more important than their appearance. In other words, don't base your planting decisions solely on what a plant looks like. 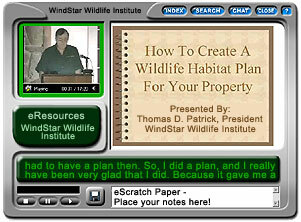 Following are WindStar Wildlife Institute's plant recommendations for wildlife habitats in Wisconsin. Thousands of years ago, most of Wisconsin was visited by glaciers, scraping the tops off hills, leaving rich earth deposits and leaving a land of beautiful lakes (15,000 of them) resting in fertile plains and valleys arranged between rolling hills and ridges. This state can be divided into five geographical land areas; the Lake Superior Lowland, the Eastern Ridges and Lowlands (Great Lakes Plains), the Northern Highland, or Superior Upland, the Central Plain and the Western Upland. The Botanical Club of Wisconsin can provide lists of plants for a specific region.